Whether the weather is hot or not, it is hard to keep clothes smelling fresh. In the summer months, when the weather it hot, perspiration is unavoidable part of the daily life. Today, we will talk about how to remove perspiration odor from clothes. After all, you want your clothes to smell fresh, no matter the weather outside. Even in the winter months, perspiration is perfectly normal. Sweating is our body’s natural way of maintaining a regular temperature. However, what happens when the weather is hot and humid is that we experience buildup of perspiration, which can linger on clothing. With that in mind, let’s take a look at all the ways how to remove perspiration odor from clothes. Vinegar is one of the best ways to remove odor from clothes and keep them feeling and smelling fresh. You need white vinegar for this remedy. Apple cider vinegar will not work. Add one cup of white vinegar to a tub of warm and clean water. Soak your clothes in the mixture for two or three hours. Add them in the washing machine as you regularly do. Vinegar will kill the bacteria that grow due to moist and humid environment. They say that sweat odor can be a headache. So, what do you use for a headache? Take an aspirin. You can use this drug not only for aches and pains, but for cleaning clothes as well. The reason is aspirin contain salicylic acid, which can penetrate deep into the fabric of the clothes and break down the proteins in the stain. For this remedy, crush a couple of uncoated aspirin tables and mix them with warm water. Once you have thick paste, apply directly into the stain, rub gently, and then leave it to sit for one hour. Put the clothes in the laundry as usual. These two ingredients can work on their own to remove odor from clothes and from under the arm area. For this remedy, you need one part of baking soda, one part water, and one part hydrogen peroxide, or about ¼ cup of each ingredient for one shirt. Put a thick white towel on your countertop area, and then put the shirt on it. Rub the solution into stains and allow it to sit for 30 minutes. You can use soft bristle brush to loosen any residue. Wash as usual afterwards. This solution works only for white clothes. You need one part oxygen-based bleach, and one part household ammonia. Never used chlorine bleach, as you can cause deadly fumes. In a well-ventilated room, put rubber gloves, and mix two tablespoons of each ingredient per shirt in a bowl. Protect your work surface, and then rub the solution into stains with a soft bristle brush for 30 seconds. Allow it to clean your shirt for 10 minutes, and then wash as usual. If you want to use only baking soda, you need to add one-half cup of baking soda to each laundry load. 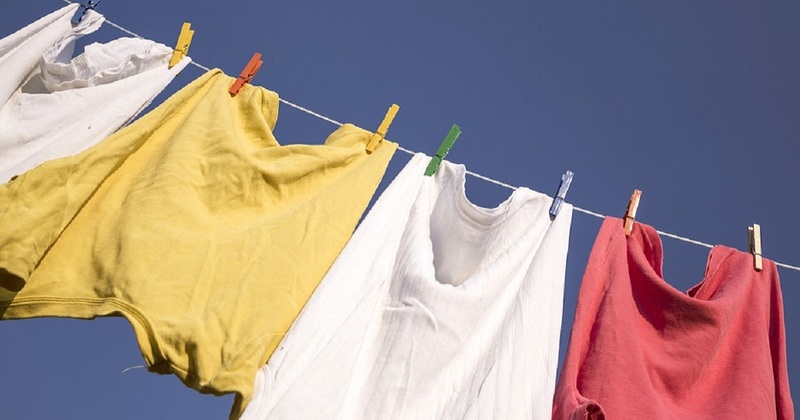 This will help your detergent work more effectively and reduce bacteria. For heavy odor problems, you need to use baking soda as a presoak. Dissolve a cup of baking soda in warm water, and then fill a washer tub or large sink with cool water and the dissolved baking soda. Put clothes into the solution, and then let them soak overnight. You can put them in the washer the next day as usual.